After the wonderful program in Lendava, Croatia, we continued our journey the next day to Slovenia. 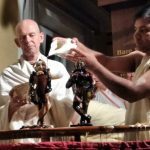 Shortly after our arrival at the temple in Ljubljana (24 August), Kadamba Kanana Swami led a fired up kirtan and gave an evening class in anticipation of the upcoming Janmastami Festival. 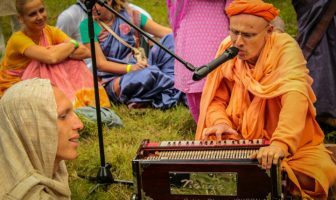 In his class, Maharaj mentioned the nine-fold process of bhakti and explained how we should follow each of these. 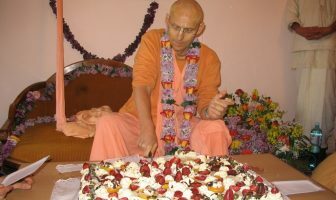 He went on to emphasize what a special day Janmastami is for us, as devotees, and that we have to make some special endeavor for Krsna on his appearance day – the special service we perform on Janmastami will help us in the future; it will be like a handle which we can use to pull ourselves up; once we do something for Krsna, we can do it again and more often! On Janmastami day, the enthusiasm was high. 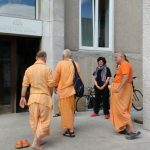 Many disciples and other devotees had travelled from surrounding countries to be in Ljubljana for the special occasion. 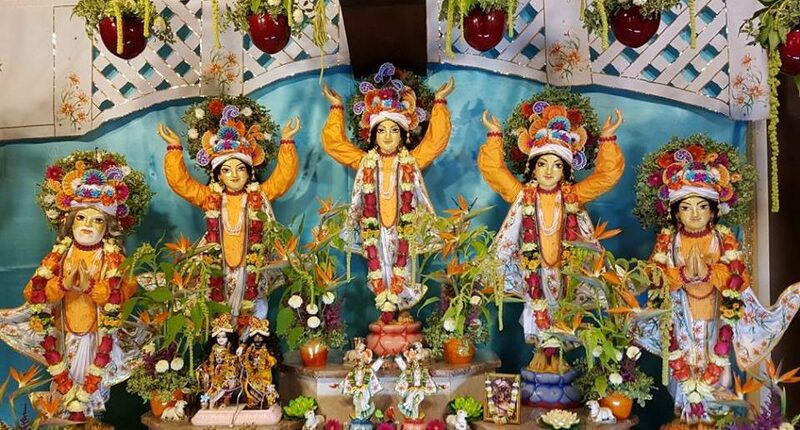 The presiding Panca Tattva deities at the temple looked splendid in their outfit. 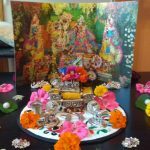 Maharaj wanted Giriraja to have some extra offerings on Janmastami so we got Him a bigger altar table and fancy decoration. Maharaj was thinking that Giriraja should have a turban as well, and then somebody just gave us one which matched the flowers perfectly! Maharaj gave two classes where he shared wonderful pastimes of Krsna. 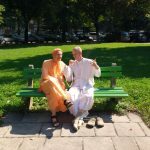 Sureshwar Prabhu (ACBSP), a long-time friend of Kadamba Kanana Swami, was also in Ljubljana and was in the audience during the class. 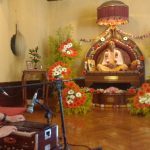 His presence inspired Maharaj to speak about Srila Prabhupada! In between the activities scheduled on Janmastami day, Maharaj took some time to rest. 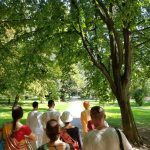 We also went for a walk to a nearby park with Sureshwar Prabhu and some disciples. 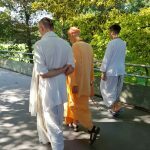 During the walk, Maharaj and Sureshwar Prabhu discussed stories of Srila Prabhupada and made a plan on what they were going to speak about in the upcoming lectures. 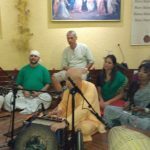 The highlight of the evening program was the abhisek and during this time, Maharaj led a wild kirtan and went on even after the auspicious bathing ceremony was over. As midnight approached, all the devotees gathered in the temple room for the special darshan and aarti! At 1 am, Maharaj and Sureshwar Prabhu finally ended their fast. 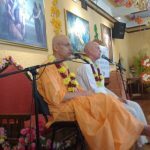 Prabhupada’s Vyasa Puja celebration continued the next morning with a joint morning class given by Kadamba Kanana Swami and Sureshwar Prabhu. 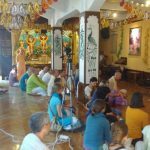 They took turns to glorify Prabhupada and told personal stories of being touched by Srila Prabhupada’s mercy. 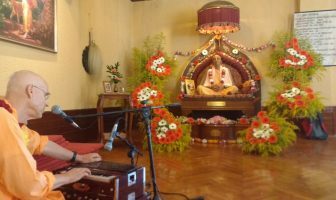 Sureshwar Prabhu spoke about the first ever Janmastami in ISKCON’s history and told the famous story of the “falling dandas” where the early devotees were not yet accustomed to fasting for such a long time and celebrating Srila Prabhupada’s Vyasa Puja right after and because of being sleep deprived, they dropped their dandas during Prabhupada’s Vyasa Puja lecture. He went on to describe his personal first Janmastami and how he experienced it. 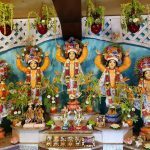 It is amazing how much ISKCON changed over the years but Srila Prabhupada’s spirit is still here, especially in his disciples. Maharaj then sang the Guruvastakam prayer which was followed by a pushpanjali (offering of flower petals). After the program, despite being extremely exhausted from the previous late night, Maharaj took time to speak to as many people as he could before having to leave the temple in the early evening to catch our flight to Berlin, from where we made it to Leipzig for the Ratha Yatra which took place the very next day after Srila Prabhupada’s Vyasa Puja.